The Spanish River in Algoma, Ontario, for some of the best walleye fishing in North America. Our crew arrived at Waterfalls Lodge in Spanish, Ontario late Sunday afternoon, but just in time for the weekly get-together in the main lodge prior to dinner to meet the other guests, who had arrived a day earlier for a weeks-long fishing vacation with a host of friends and family members. As a weekly tradition of sharing fishing tales and enjoying appetizers and free drinks, courtesy of the owners of the lodge, this “happy hour” truly was a do-not-miss affair and a great way to start our road trip. This region of Algoma has so many opportunities to fish for almost any species of fish you so desire, with longer open seasons than many of our southern regions across Ontario. Whether it be for bass, northern pike, trout, or walleye, Algoma has the resources, lodges, and lakes to satisfy anyone's thirst for angling adventure. Waterfalls Lodge offers a wide variety of angling opportunities on the main lake chain, remote back-lake ATV trips, and guided trips a short 10-minute jog up the highway to the Spanish River for the ever-abundant walleye in the river and the North Channel leading to Lake Huron. We chose the Spanish River and walleye option on this trip. Fishing with lodge guide “Big Al” and his fully loaded Legend boat, we headed out of the Spanish Marina and decided to fish the lake first since the wind was low and the lake as calm as glass. Al headed to a rocky point with a slight ditch in 12 feet of water a short ride out from the marina. We held our position with his electric motor and cast 1/4-ounce and 3/8-ounce jig heads in bright chartreuse and threaded a night crawler (worm) onto the jig. Then we headed to the edge of the ditch leading to deeper water with a semi-slack line, while letting the jig bounce on bottom as we slowly lifted and dropped our rod tips, jigging our presentations across the ditch back towards the boat. It did not take long, maybe three or four casts, before I had my first walleye of the year twisting and turning along side the boat, a nice 15-inch fish. We continued our efforts in front of the rocky point as the wind started to churn up the water and inspire the walleyes to really put on the “chew,” helping us get bit on almost every cast for a half-hour window, and put four slot sized walleyes in our live well. With the wind picking up, Al suggested we head to the river, do some “drifts” over the deep edges and breaks with the same jig and worm setups, and try to catch some bigger walleye in the Spanish River. Our first drift over 23 feet of water, rising to 16 feet, produced a solid 18-inch walleye. We continued our drifts while watching the depth on our electronics and staying the course in the middle of the river, as the screen constantly lit up with fish symbols all through the water column. The thicker fish symbols (walleye) were approximately one to two feet off bottom, exactly where our jig and worm presentations were bouncing as we drifted down the river. Our gear for the day included St.Croix Avid X and Legend Elite Medium action spinning rods rigged with 8-pound fluorocarbon lines and 1/4- to 3/8-ounce round ball head jigs and a good old-fashioned earthworm. Watching our depth was paramount to staying on the suspended fish in the river, and letting out enough line to ensure your jig was bouncing off bottom kept our baits in front of walleye on each drift. Mother Nature decided we had enough fish and fun for one morning, as she rolled in the storm clouds and rain just as we packed up and headed back to the safe confines of the marina to end our morning walleye adventure on the Spanish River. If you're looking for a great location for a wide variety of finned critters that swim, look no further than Algoma and Waterfalls Lodge in Spanish, Ontario. The fishing opportunities are limitless and the lodge facilities are top-notch, friendly, and clean. Check out Waterfalls Lodge and experience the Spanish 'eyes of Algoma for yourself, it truly is an angler's paradise. Click here for the original article with pictures. 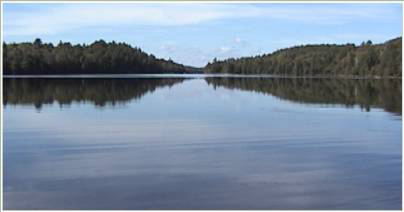 Spanish, Ontario's Tube Lake, a 2 1/2 hour drive east of the U.S. Border at Sault Ste. Marie, Michigan, is a quick trip for trailer boats. There, plentiful baitfish power a population in the 20-inch range, with some 7-pounders. Spring fish groove on mainlake gravel points and tuck within timber on the south-west shore. After being absolutely spoiled rotten during our last visit to Waterfalls Lodge, we should have been prepared to contend with Mother Nature's wicked awful best this year. I reckon the measure of an angler is how well he or she adjusts to adverse weather conditions despite lofty anticipations borne from months of lustful, piscine daydreams. Still, we were at Waterfalls Lodge near Spanish, Ontario, home of luxury accommodations across the board. Equal home to significant fish of multiple species, our primary quarry being their deep-bodied smallmouth bass. Once again this past late September, www.riversmallies.com staffers and seasoned RS patrons descended upon Waterfalls Lodge near Spanish, Ontario. Abandoning our deep-seated, individual passions for flowing resource smallmouths, we excitedly arrived in search of their cinderblock, Canadian Lake brethren. 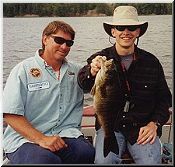 The week prior to the riversmallies.com gang's arrival I fished and filmed with Don Meissner of PBS's Streamside television show. We enjoyed fair skies and light winds as we garnered video footage to support a new product from Lake & Stream Technologies. An additional luxury was utilizing the Waterfalls Lodge accommodations as home base, then venturing out to new, "virgin" waters. Well, virgin to us anyway. What a delight it was to drive 20 minutes, on good road, and explore the mysterious Hannah Lake via the gravel beach launch at Laroque Lake. Interestingly enough, Don and I recorded our hottest fishing action of the week on this resource during our first ever visit there! Pretty nifty. Quality smallmouth bass approaching 4 pounds and some really nice northern pike. Then Ma Nature and the weather Gods had a little conference, and each seemed to leave this summit rather angrily. I fished, and fought wind & waves the second week with Brian King, co-founder of riversmallies.com. Our mutual friend and RS co-founder, Marc Hutchison, could not make the trip this fall and was sorely missed. I fished the following week (and fought wind, waves, and snow!) with savvy bronze anglers from the Heartland, characters like Josh McDermott, Dan'l Wirrig, Ken "on fire-fire" Kirby, Ron "Riverdog" Bell and Josh's brother, Matt. Make no mistake these gents could catch fish out of an Iowa mud puddle, let alone the bountiful waters of Waterfalls Lodge. Indeed, the fall pattern of large Canadian smallmouths returning to the shallows for an urgent feeding binge can be spotty at best. Wonderful angling if you hit it just right, and painfully frustrating when you don't. Yet I've taken autumnal smallmouths in excess of 6 pounds during each and every of my trips to Waterfalls Lodge since 1994. This year was no exception despite the less than exemplary weather conditions. Ken Kirby enjoyed a true beast of a smallmouth, a "toad" as he called it, which blasted his beloved Splash-It top water bait twice. Evenings and mornings were by far the most productive for the top water bite. Mr. King and I enjoyed some rather nervous top water action a couple of odd mornings when we were graced with calm winds. Quite memorable was a northern pike that elected to absolutely obliterate Brian's bass-intended Storm Chug Bug. I just didn't have the touch this trip for the top water bite, but Brian exercised several dandy smallmouths on the surface lures. When daily cold fronts started blowing through we elected to move offshore just a bit and throw weighted Case SS Shads on 3/0 Magic hooks in the lighter chop hoping to tease suspended, browsing bass. We kept Jann's Mud Puppi tubes with * ounce insert heads at the ready on rod #2 for the periods of rougher water. The bigger bass appeared to be scattered and grumpy, yet this one-two punch brought the odd, larger bass to thumb. At the peak and post of fowl weather scouring through we simply went "low & slow" and fished specific, main lake areas more thoroughly. Some of the bass were glued to timber and some were in the shallows of what looked like classic pike water. Dan'l, Josh, Matt, Ken, and Riverdog all cashed in on this "grumpy bite" as all of them are moderately deadly with a low-n-slow, jig-n-pig presentation during those conditions. I'm admittedly tube stubborn, yet we all took our fair share of 3 to 4 pound bass. Riverdog tried a funky, squash/glitter tube that I recommended for walleyes and ended up catching his best ever walleye, a shade over 10 pounds, brandishing huge marbled eyes the size of Mr. McDermott's when we ran out of beer. Hints of fair weather ushering episodes of calmer winds found us out in the front of secluded, protected coves and bays on Kecil Lake with Brian laying down the law via his patient, twitch-twitch cadence of the Case SS Shad. These heavily forested pockets of refugia definitely held more bass than in years past. Most of the SS Shad and Super Fluke bass were browsing & suspended over 10 to 15 feet, and they sure didn't seem to stay in one place for very long. We agreed to move and browse main lake points, humps and offshore shoals as much as we thought the fish were doing. Obvious that the weather and aquatic conditions can never be perfect multiple years in a row, no matter how much we want them to be. Fall fishing is spotty at best, but it will often deliver the largest fish of the season. Sometimes the angler should take a break from the grumpy, intended quarry and simply pursue other species. Yet another luxury at Waterfalls Lodge is the availability of multi-species should the autumn bass be indifferent to your offerings. Water temperatures just were not fixed on a stable warming trend as in years past and, in fact, were dropping rapidly. Many of my historically productive ambush spots - "milk runs" - if you will, swiftly became dominated by the pike. I seemed destined to keep us in pike filets all week and was perfectly thrilled to do just that. The northerns were really tuned in to a tuned, #18, floating perch Rapala. We thoughtfully released our larger pike over 8 pounds as the smaller ones from 3 to 6 pounds are the perfect eaters. And let me tell you, when properly cleaned & dressed northern pike are superb table fare. If you haven't tried them you really should. As the Bluegrass State is a bit lean on northern pike resources, I'm fairly certain that I've converted Mr. King from Mrs. Paul's to the Gimp's deep-fried, beer-battered pike chunks! Another luxury that you will discover at Waterfalls Lodge is the skill level of their guides. Should you visit Waterfalls Lodge and you aren't quite secure with your filleting skills, simply poke Richard, Ed, Edward, or Jerome and they will make swift work of your toothy critter catch of the day. Richard, especially, has a wonderful technique for taking out the Y bones of these delicious water wolves. He's also a peach of a guy, definitely a keeper! I highly recommend booking Richard for half a day, or a full day, during your initial visit to Waterfalls Lodge. He may be married to the jig-n-minnow, but he knows these lakes like the back of his hands. While the outrageous fall feeding binges simply did not transpire for us this year like they did last year, a mediocre day at Waterfalls Lodge sure beats a sharp stick in the eye. I sincerely enjoyed the fellowship of my friends and value that fellowship far more than the size or numbers of the fish that I am catching. This year was equally rewarding for me despite some personal setbacks. The warmth of Waterfalls Lodge, the staff, the accommodations, the food, and the Lodge itself truly make this a luxury in the wilderness. Waterfalls Lodge is a rather easy drive from most of the mid-West states and Bob & Marilou Rogers and staff will go out of their way to ensure you or your group a quality experience. I truly look forward to the next www.riversmallies.com Canadian adventure at Waterfalls Lodge and feeding that water with both familiar and new faces. Should anyone have any questions about the Lodge or want basic yet sound advice on how to fish the main lakes or the Lodge's outpost lakes, feel free to contact me privately. Marc Hutchison, Steven Flint, and I recently spent a week fishing in Ontario, Canada at Waterfalls Lodge. This fine facility is located near Spanish, Ontario and owned by Bob and Marilou Rogers. The lodge sits nestled at the southern end of a chain of lakes. For Marc and I, this was our first trip to Waterfalls, but for Steven, just one of many. Marc and I entered Canada from Michigan at Sault Ste. Marie. From there it was just over 2 hours to Spanish. There are several cottages to choose from that range from 1 to 4 bedrooms. Each cottage has hot/cold running water, electric, heat, full bathrooms, and kitchens with refrigerators, stoves, coffee makers, toasters, dishes, etc. There is a bed per person with linens and pillows. Propane grills are also supplied for each cottage. There is a store on-site where you can purchase tackle, bait, gifts, and your fishing license. The main lodge (pictured above) is a new building and houses the dining room and bar. The lodge is decorated with various fish and game mounts and also has a television and pool table. Depending on your preferences, you can fix your own meals in your cottage or eat in the dining room. The food prepared by the staff is first-rate! For those who prefer to "rough it" a bit, there are RV and camp sites available. A shower house provides full bathroom facilities and a washer/dryer. Boats are available for use if you tell them you'll need one when making your reservation. You may bring your own boat if you prefer. There is a nice launch right in front of the store. If you'd like to try something a little different, you can schedule an outpost trip to a remote lake. Travel is done by ATV's and you'll be accompanied by a guide. The ride to and from the remote lake is half the fun! The outpost trip includes lunch, boats, motors, gas, and bait. If you want to fish even bigger water, you can use the services of one of the guides to fish the North Channel of Lake Huron for a variety of fish species. Bob and Marilou maintain a boat specifically for this purpose. For those who want to experience some Canadian river fishing, you have access to the Big Serpent River, Little Serpent River, and Aux Sable River within a short drive of the lodge. The fishing season begins in mid-May and bass season opens the last Saturday of June. Waterfalls Lodge also caters to bear and moose hunters. Bear hunting is done in September and moose hunting in October. Complete packages are available. Reservations are limited to a certain number of hunters. Check the Waterfalls Lodge web site for package details and information concerning firearms in Canada. Snowmobiling and ice fishing are popular winter activities. From the lodge you can access thousands of miles of snowmobile trails. The trails are kept groomed and in good shape. Ice fishing packages are available just like the other fishing and hunting packages. Sightseeing activities include trips to Big Nickel Mine, Science North, and Elliot Lake. There are several places you can visit within an hour's drive of Waterfalls. Our week at the lodge was nothing short of wonderful! We did have some rain near the end of the week, but we were able to fish through most of it. The three of us tangled with some nice smallies and northerns! Bob and Marilou run a top-notch lodge with excellent food, clean cottages, and expert guides. They made us feel right at home! Now that I have been there, I would not hesitate to recommend Waterfalls to anyone who wants to try their hand at Canadian fishing. Below is all of the contact information. It's ironic that I mention how hard our staff works and follow it up with the work assignment I pulled in late July-a Canadian smallmouth fishing trip with three other buddies and our sons. Whew! One tough assignment! I've said it before and I'll say it again, "it's part of my job-really!" The guilt makes telling this story tough. You'll understand as details of this trip play out. You see, usually the wilderness dredge of normal fishing trips to Ontario make non-tough guys sigh and feel thankful they didn't take part. You know, things like mosquitoes and black flies so thick they'd pick you up and turn you around without noticing, two weeks later you're still tending to the welts. The accommodations or lack of the likes of which Lewis and Clark would have refused. Boats that leaked, motors that worked part-time, wet foul weather and floatplane rides that may not have been approved by the FAA. But yet we've persevered and still caught fish! After telling my wife our tales of past Canadian fishing trips she'd usually respond with a quick, "you're nuts!" or you'd never get me up there! After returning on our latest trip and going through the daily happenings with my wife, she stopped me after the first day's story and batted her eyes and said, "and you didn't take me?" Surely that'll give you a good idea of just how plush and relaxing our four days in the bush ­well-at least it was northern Ontario, was. Our entourage on this trip included Imlay City's Chief of Police Arlan Winslow and his son 15 year old Adam, Imlay's Chevy-GMAC dealer Bruce Milnes and his 13 year old son Blake, publisher Randy Jorgensen and his 15 year old son Keil and my 12 year old son Nick. Our destination was Waterfalls Lodge in Spanish Ontario and our goal was smallmouth bass fishing, with a bonus of a few walleyes, perch, bluegills and northern pike. Plus plenty of laughs and a few father-son memories. Let me tell you this place was no struggle in the northern wilds-not by a long shot. Our living quarters had four bedrooms, two baths-both with showers, complete kitchen and if that didn't beat all-we even had maid service. We also elected the American plan, which included three meals a day. Bob and Marilou Rogers have owned the resort for the past several years and they recently added a dining facility with a full bar, pool table, satellite TV dartboard and even air conditioning. We ate terrific meals like a complete turkey dinner including pumpkin pie for desert and then there was steak night where Bob does the grilling. All of this and served in a beautiful knotty pine facility called the "Lodge"-what a wilderness fishing trip this was! The weather was hot and sunny, although a few evening showers rolled in a couple of times. The boats didn't leak and the motors started with one pull. And oh yeah, let's not forget about fishing. 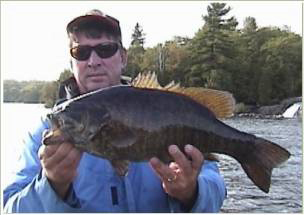 Bob offers a guided wilderness catch and release smallmouth-fishing trip that simply boggles your fish loving mind. The smallmouth fishing on this lake was just grand. Hole after hole produced two and three-pound smallmouth that fought like hungry junkyard dogs with wings. Nick referred to them as "sailfish wannabes." And there were bigger fish. It was a blast for me watching the young guys landing hard fighting fish with their grunts, strains and "oh my goshes" as their poles bent in a "U" shape. What fun! The only way back to this special lake is by quad runners through twisting and turning trails that takes about an hour to get in. Seeing plenty of bear, moose and wolf tracks and signs gave the trip that true wilderness flavor. Ed, our guide for the day, advised us the day before to keep our fishing technique simple, plain bait hooks, split shot, and crawlers or leeches. He didn't argue his point, he just said it works best and followed it with a story of taking in some famous pro bass fishermen and lugging three giant size tackle boxes. For six hours the pros threw every lure they had. Finally they tried Ed's method and caught fish after fish. I didn't need to be convinced, Larry Walter taught me this lesson years ago and I still catch a majority of my fish on a small #8 or #10 hook, small split shot, and light line-it works. The eight of us had a terrific time on our so-called wilderness Ontario fishing trip, the accommodations, camaraderie and fishing, made for some wonderful memories and some quality time between fathers and sons. I eagerly look forward to next year's adventure. For more information on Waterfalls Lodge call Bob or Marilou Rogers at 1-800-666-2812. They offer family fishing get-a-ways, bear and moose hunts. Caption: This pike hit a spinner bait, providing a great fight on a medium weight bass rod. Just look at that grin on Fred Shimp's mug! He certainly seems to be enjoying hoisting up that 17-pound water wolf, and I thoroughly enjoyed witnessing the event. This robust northern pike is the largest that Fred has ever boated (and released) and it came during his very first experience at Waterfalls Lodge in Spanish, Ontario. Fred had requested I guide him for a few days when he booked his September trip to Waterfalls Lodge during the Columbus Sports, Vacation & Travel Show last winter. While we caught several nice and eating sized pike earlier in the week, our primary focus was on the cinder block-like smallmouth that inhabit these waters. This large pike hit on the second to last day of the trip up in the narrows as you enter Lang Lake. The powerful toothy critter slammed an orange bladed black bucktail spinnerbait and just about maxed out his medium heavy weight, bass sized baitcasting outfit. Multi-species sportfishing opportunities abound at Waterfalls, but it is the brutish smallmouth bass that live here that got this Ohio Smallmouth Alliance Board Member fired up nearly a decade ago. The beauty is that you can drive to this fine Ontario fishery, making it an excellent fishing holiday for the entire family. No need to pay a thousand bucks a week per person, exiting a commercial flight and entering a bush plane to finish the last leg to wilderness fishing. From just about anywhere in Ohio you can comfortably drive to Waterfalls Lodge in about twelve hours. The lodge is a two and a half-hour drive east of Sault Ste. Marie, Michigan. Good walleye, lake trout, and perch fishing exists in the four main lakes, if you can tear yourself away from casting for the smallmouth. There are four main lakes to explore upon leaving the docks with some 14 miles of the prettiest structure you'll find anywhere. The wilderness fishing doesn't stop there. Guided day trips are available to three remote outpost lakes that are just full of big smallmouth bass. I split my time this September visit between assisting Mr. Shimp, and the head guide, Mr. Ed Duff, with groups of anglers who reserved trips to these beautiful remote lakes. Ed knows this country as well as any of the natives and happens to be a very skilled angler. Half the fun of an outpost trip is getting there. My outpost lake of choice is Bellows, a large lake dotted with rock piles, rock slides, and shoals that loom up out of the extremely clear, deep water. The lake has a serious biomass of smallmouth, including some rather large specimens. Bellows also harbors some beautiful splake in the (over) twenty-inch class. The splake is a hybridized cross between a lake trout and a brook trout. Interestingly enough, there are no pike in Bellows. Rest assured that when you feel that tap on the line it is usually a smallmouth. My largest one during this outpost excursion went six pounds, eight ounces. As usual with this particular trip, the majority of the big smallmouths took topwater baits. Storm's chrome/blue back Chug Bug is particularly effective on these waters. Pods of ciscoes will roam the initial ledges and drop-offs and that color Chug Bug is a good surface imitation. Besides, there is no better sound in the world than a four or five pounds of angry bronze crashing into a surface bait while the soft, haunting call of a loon drifts across the Canadian crownland. The bass at Waterfalls waste no time communicating to you what they want. Finding them is the key. Smallies will spend spring and early summer here feeding heavily on available crayfish, young of year perch, and frogs. When these stocks are depleted the bass tend to start roaming a bit deeper after pelagic fish forage like alewifes and ciscoes. Towards fall, the smallmouth again hunt shallower in search of leftover craws and juvenile perch and panfish. Over the last couple of years, I have formed great confidence in a "T-n-T" pattern. Tubes and topwater baits. Venom's Erie Series tubes in the green mustard are very effective, as are Cabin Creek's Salty Mother tubes. A 1/16 or 1/8 ounce darter head jig inserted will give the tube an erratic but slow descent. Skipping these tubes towards and over the rock piles and deadheads often produces savage strikes before you can engage the bail on your spinning reel. Countless times I've had big smallmouth up here boil under a Zara spook or Chug Bug but miss it. Grab the tube rod and immediately skip the tube into t he boil zone and nine times out of ten that big smallmouth will slurp it in. Soft plastic twitchbaits like Zoom's Flukes and Sluggos work well at Waterfalls. The alewife colors are effective as they resemble the native ciscoes. Cloudy days at Waterfalls afford topwater smallmouth fishing all day long and into the night. During bright sunny skies, or in the warmth of summer, the bass will move deeper, but not far from the lake's main structural elements. Then _ ounce tubes, grubs, lizards, and Slider rigs become very productive. Don't forget the good 'ole hair jigs. Maribou and natural hair jigs in 1/8-ounce size are extremely productive in late spring and early summer. A perch pattern hair jig twitched and hopped in ten to twenty feet of water will also produce some of the twenty five inch plus walleyes that cruise the ledges in the spring. Long rodders will do very well at Waterfalls. A six or seven weight outfit will do nicely. Poppers, large Sneaky Petes, small Dahlburg Divers, and Clouser Deep Minnows will all take smallmouth. 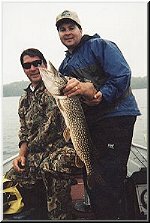 We have had good success on northern pike with large, perch patterned streamers and Decievers. Though you'll need a bigger flyrod that the six weight! Late spring and early summer has the fish shallower and may be the best time for the flyrodder. But any week at Waterfalls sure beats a week of not being there. Big smallmouth, northerns, walleye, and lake trout that you can drive to. Comfortable accommodations and excellent food in the Four Seasons dining room. Spectacular shorelines littered with fantastic structure with plenty of northern smallies over six pounds. (Bass Season opens on the fourth Saturday in June). I have pursued the smallmouth bass across the lower 48 and Canada for nearly twenty years. This "drive to" outfit in Spanish, Ontario offers one of the most affordable and appealing sportfishing excursions you'll find anywhere. You will do well to contact the Waterfalls Lodge owners, Bob & Marilou Rogers, at 1-800-666-2812. Just a quick note to thank each of you once again for all your help and hospitality while my crew and I were in your area. We spend so much time away from home that "feeling at home" while away is a very special thing. You both personally saw to that. As for the fishing... what can I say. I had a great time exploring Kecil, Trout, Marion, Lang and Tube. There's nothing like the beauty of a Canadian lake and the thrill of catching big smallmouth one after another. You truly have a piece of heaven in your own back yard and I look forward to visiting again at some point in the future. Add to the fantastic fishing a well-organized camp with good accommodations and fine food---I was impressed. Rest assured that my staff and I will be spreading the "good news" of Waterfalls Lodge, not only on my "Good Fishing" series, but by word of mouth as well. Greetings from northern New York. I hope this letter finds you and the lodge in good health. Well, almost a year to the day, we've completed the Streamside Show featuring Waterfalls Lodge. A copy of that show is enclosed with this letter. It was competed only a few weeks ago so you can see we are keeping very busy! Anyway, thanks again for your super hospitality and help in making another chapter of the show possible. We look forward to doing more with you folks in the future. Greetings to Dennis and the rest of your staff. Congratulations on having an excellent fishing report submitted to North American Fisherman by one of your past guests and having it published in the March issue of North American Fisherman. Enclosed you will find a copy of the magazine with your report appearing on page 139. Again, congratulations on the published report. Life member Tom Marshall of Granville, Ohio caught this 7-pound, 28-inch walleye while fishing without a guide on Kecil Lake, Ontario. During his eight-day stay at Waterfalls Lodge, Tom also fished pike and lake trout on a number of area waters. Tom rated the accommodations, as well as the size and quantity of fish caught, as good. He awarded excellent ratings for competence of the personnel, condition of boats and motors and the food at the lodge. "I have been to Waterfalls Lodge several times", Tom said. "It is well managed, and they have made improvements every year. Although we usually do our own housekeeping, the meals in the dining room are excellent". Member, Leo Duda Jr. of Hampton, Virginia spent three weeks at Waterfalls Lodge, where he caught lake trout, walleyes, smallmouth bass and panfish on several local lakes. He landed this 40-inch pike as well, and rated size of fish caught as excellent. "On your first day, they even take you on a guided tour of the beautiful lakes in the area". Competence of guide Bob Rogers was rated excellent, as were food and accommodations. "We expected a good trip, but this was an excellent fishing adventure. We heartily recommend Waterfalls Lodge to other NAFC members". Here's Huggler's picks for the best lake trout, northern pike, brook trout and smallmouth bass fishing lodges in Canada. Dreaming about the ultimate Canadian fishing trip starts early in life. As a boy, I watched my father return from Ontario adventures with coolers of rainbow trout and wide-eyed tales of bigger fish that got away. Then in 1964, a high school buddy and I pooled our resources from 75-cents-an-hour supermarket carryout jobs and bought tickets to the Canadian bush. The fee was $60 each for air travel, a cabin, boat and motor, and a brook trout lake all to ourselves. We caught and released about 400 trout, none of which was more than a foot long. That didn't matter. I was hooked on fishing in Canada. I still am. Twenty-five years later I continue to travel and fish throughout the magnetic lands of our northern neighbor. Some trips have been fabulous, while others were only so-so. Four recent trips have been the best I've taken. What follows are my choices for fantastic giant lake trout, northern pike, brook trout and smallmouth bass fishing. First, a little advice. If you're planning the ultimate Canadian fishing trip, be willing to do some homework. That means you should compare rates, ask questions like "What will I get for my investment of time and money?" and request references. Just last week a friend of mine told me a horror story about a dream fishing vacation he had taken to Ontario. The outfitter was rude and unreliable, and the trip was a complete bust. "I should have checked things out more carefully," my friend said soberly. Good fishing comes and goes. So do cooks and guides. The businesses themselves maybe sold and resold. For these reasons, it is always best to get accurate, updated information. One other tip: When sorting out the possibilities, choose a reputable lodge and an outfitter who specializes in one or more species of trophy fish. Then, pick the right time to go, and key your efforts on that one species. Everything else you catch will be a bonus. Don't think for a minute that all my Canadian fishing trips are as wonderful as the four that follow. I sorted through notes from many trips to come up with these top picks. Depending on your budget and what you like to fish for, NAFC members thinking about the ultimate fishing trip to Canada need dream no more. Some of your homework is already done for you. Now, here are my choices. 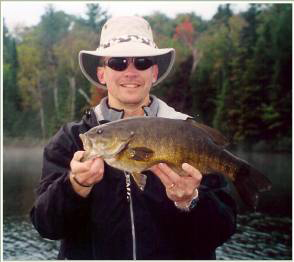 The smallmouth average 2 to 2-1/2 pounds at Waterfalls Lodge in southern Ontario, but there are plenty of trophy-sized fish too. Nestled at the top of Lake Huron and within easy driving distance of Detroit, Chicago and Buffalo is Waterfalls Lodge and home of excellent smallmouth bass fishing. The housekeeping package includes a comfortable cottage with flush toilets and showers, boat, motor and gas. Evening and full meal plans are available and shorter trips also. Waterfalls Lodge is located between two lakes on a chain of five lakes. 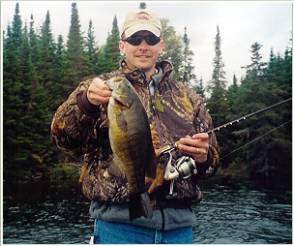 The smallmouth fishing is excellent in spring and fall and good throughout the summer. The fish average 2 to 2-1/2 pounds but there are plenty of 3-and4-pounders. I caught several on small jigs that resembled crayfish, the bass' principal forage. Tom Cunningham, a bass fishing friend from Indiana with whom I fished, caught a 6-pounder the day before my arrival and missed a fish that he estimated at 8 pounds. The best fishing occurs on Kecil lake, which also has lake trout to 30 pounds. We marked hundreds of them suspended over 90 feet of water, but couldn't get any to hit. 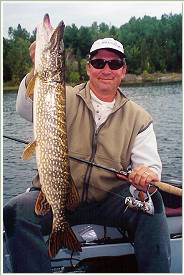 The chain of lakes, which feeds the Serpent River, is also home to good numbers of northern pike. We caught several between 5 and 10 pounds, but much bigger fish swim there. For those anglers wanting a more remote experience, there is an outpost log cabin with more good bass fishing on three wilderness lakes. You don't need a guide here, but guides are available at a nominal fee for those who insist on it.